As you drive through your neighborhood, you may see fliers, signs and more attached to Gibson EMC's electric poles. Besides being unattractive, cluttered utility poles make it much more difficult and dangerous for lineworkers to do their job. Whether it’s in the middle of an icy winter’s night or a summer lightning storm, our lineworkers climb poles during all hours of the day or night, in all types of weather conditions to maintain and repair the equipment to keep your power flowing. Lineworkers wear “hooks” that sink into the wood as they climb up and down the poles. These hooks are vital in giving them the solid hold they must have in order to safely work on the poles and lines that carry power to homes and businesses throughout the cooperative’s service area. Lineworkers must be able to secure their hooks easily into the pole, a feat that is difficult if they must navigate a sea of metal tacks and staples. And if a lineworker should lose his hold on the pole, he could fall and be seriously injured or even killed. 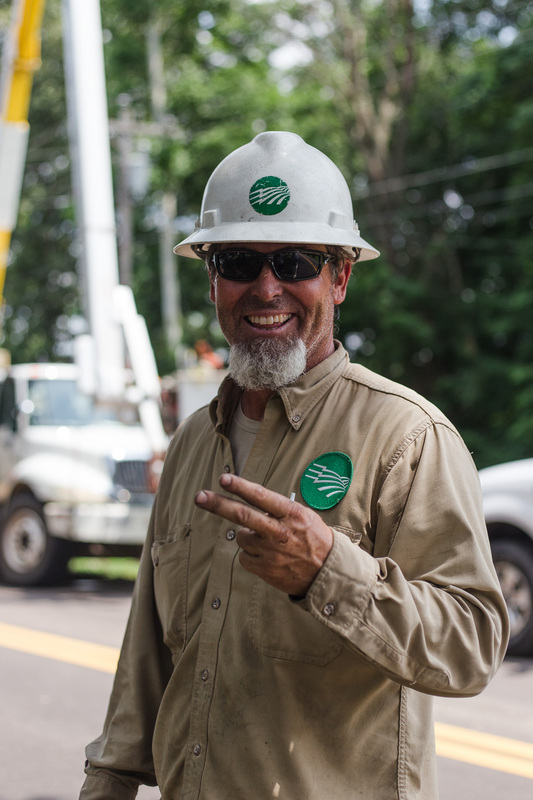 Your cooperative’s lineworkers already face serious hazards as they work to provide your electric service. We appreciate you doing all you can to help keep them safe. Space heaters can provide supplemental heat, but they also can present a safety and fire hazard. When purchasing a space heater, always choose a model with a guard in front of the heating device. This is an important safety feature as it keeps people from touching the hot surface. Always check that the space heater has been tested at an accredited laboratory to ensure it meets proper safety standards. Also consider the size of the space you want to heat when selecting a space heater. If the wrong size is purchased, it can waste energy. Carefully read the manufacturer’s safety and operating information. Make sure everyone who will be using the space heater has read the directions as well. And, make sure the safety instructions are kept in a handy place where they can be referred to later. It is important to remember to always turn off the space heater when not in use. When deciding where to place the space heater, make sure it is at least three feet from any flammable objects or chemicals. Also make sure nothing nearby can fall into the space heater and catch on fire. Place the space heater on a level, hard surface, never on carpet. This will keep it from tipping over and from starting a fire. In case the space heater should tip over, it is important to choose a model with a switch that will shut off the heater until it is turned upright again. Pay attention when plugging in the heater as well. Make sure you are not plugging it in near places that may accumulate moisture. If a space heater gets wet it can become a shock hazard. Avoid using extension cords if possible with space heaters. Check that the plug fits into the outlet securely, a loose plug may overheat. If the plug feels warm, disconnect it immediately. A portable electric generator can be a “life-saver” when faced with a lengthy outage, but if it is not installed and used properly, it also can cause serious injury and even death. Remain inside your vehicle. If you are in your car, you are not part of electricity’s path, which always looks for the shortest way to the ground. Honk your horn to alert a passerby. If someone stops to help, roll down the window and warn them not to touch the car or the power line. Ask them to phone 911 and contact Gibson EMC immediately. Wait in your car until qualified electrical workers turn the power off and tell you it’s safe to leave the car. If you must leave the car because of fire or other danger, open the door and jump away from the vehicle so no part of your body touches the vehicle and the ground at the same time. Make sure to jump with both feet together so that your feet land on the ground at the same time. After you land with both feet together, shuffle away, keeping both feet in contact with the ground constantly. Building a deck? Planting a tree? Installing a mailbox? 811 is the number you should call before you begin any digging project. The federally-mandated national "Call before You Dig" number, 811, was created to help protect you from unintentionally hitting underground utility lines while working on digging projects in Tennessee. For Kentucky, call the Hickman service center at 270-236-2521. People digging often make risky assumptions about whether or not they should get their utility lines marked due to concerns about project delays, costs and previous calls about other projects. Not calling can be life-threatening. Every digging job requires a call – even small projects like planting trees or shrubs. If you hit an underground utility line while digging, you can harm yourself or those around you, disrupt service to an entire neighborhood and potentially become responsible for fines and repair costs. Smart digging means calling 811 before every job. Whether you are a homeowner or a professional excavator, one call to 811 gets your underground utility lines marked for FREE.